Donald J. Trump's speaking and writing invite passionate reactions — maybe he’s a bluecollar, billionaire hero who speaks the language of the common man or maybe he’s a gleefully illiterate, tremendously unqualified idiot. Whatever the case, he was persuasive enough to get himself elected President of the United States and he’s been persuasive enough to keep a majority of his supporters behind him. In "Faking the News: What Rhetoric Can Teach Us About Donald J. Trump," eleven prominent rhetoric experts explain how Trump’s persuasive language works. Specifically the authors explain Trump’s persuasive uses of demagoguery, anti-Semitism, alternative facts, populism, charismatic leadership, social media, television, political slogans, visual identity/image, comedy and humor, and shame and humiliation. "Faking the News" is written for readers who may not know anything about rhetoric, so each chapter explains a feature of rhetoric and uses that lens to illuminate Trump’s rhetorical accomplishments — specifically, about how he has used and still uses language, symbols, and even style to appeal to the people in his various audiences. Ryan Skinnell is the author of "Conceding Composition: A Crooked History of Composition's Institutional Fortunes" (2016) and co-editor of "What We Wish We'd Known: Negotiating Graduate School" (2015). He is the book review editor for Present Tense: A Journal of Rhetoric in Society. Skinnell earned a PhD in English from Arizona State University in 2011. "'Faking the News' brilliantly and simply explains how Trump weaponizes language, diverting attention from issues to stir emotions like anger and resentment. These ten chapters will enable you to understand what makes his rhetoric, simplistic as it is, so effective in rousing supporters." "'Faking the News' is a valuable addition to the growing field of analysis of both Trump's conscious and intuitive use of rhetoric, propaganda, and branding in America’s profoundly disrupted politics. 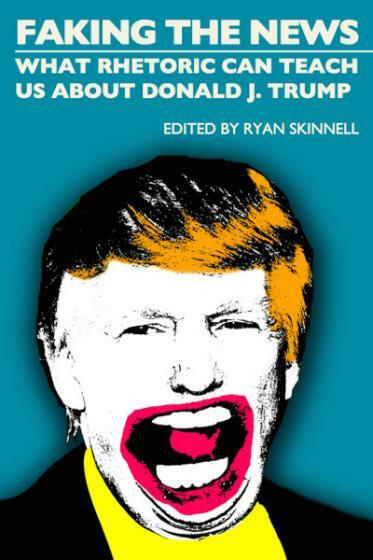 These essays are full of revelatory 'So that's why he does that!’ moments, and I highly recommend it to anyone interested in Trump’s language and his dark but brilliant manipulation of the American body politic."